Charlotte Independence claimed a 2-1 victory over Bethlehem Steel to get their season off the mark. McGuinness was appointed manager of Charlotte Independence in December. 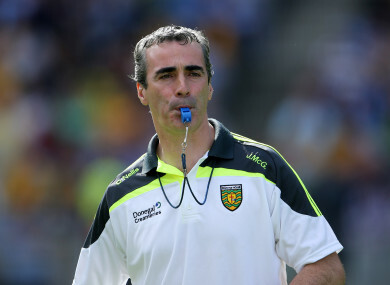 ALL-IRELAND WINNING manager Jim McGuinness has earned his first victory as head coach of US second-tier side Charlotte Independence. The North Carolina outfit have struggled with results since the Donegal man’s appointment back in December, picking up just one point from his first five games in charge. But a 2-1 win over Bethlehem Steel on Tuesday night finally got their season up and running. Celtic loanee Andrew Gutman opened Charlotte’s scoring after 29 minutes when he capitalised on a goalkeeping error to finish Mark Hill’s free-kick into the roof of the net. Hill is also on loan with Charlotte from the Parkhead club, while 18-year-old Manchester City academy product Curtis Anderson started in goals for Charlotte. Colombian Jorge Herrera doubled their advantage in the 72nd minute with a header, before Chavany Willis struck one back for Bethlehem with 10 minutes remaining. That goal left McGuinness’ charges facing a nervy finish, but they managed to hold on for their first win of the season. “I’m really relieved more than anything,” the 2012 All-Ireland winning boss told the Charlotte Post after their victory. The result leaves Charlotte 15th in the United Soccer League (USL) Championship Eastern Conference table, which is the tier below Major League Soccer. Email “Celtic loanee on target as Jim McGuinness earns first win as manager of US side”. Feedback on “Celtic loanee on target as Jim McGuinness earns first win as manager of US side”.